Glass cleaners can be used to clean a variety of surfaces. The term “glass cleaner” is a general term given to cleaners that clean without leaving streaks. This quality makes them especially useful when cleaning shiny surfaces, like glass, chrome, steel and more. It is important to keep glass clean and clear. Dirt and debris on windows can actually cause damage to the glass. Dirt and dust can etch into the glass and cause scratches and blemishes. It is also important to keep full visibility through a car windshield while driving. 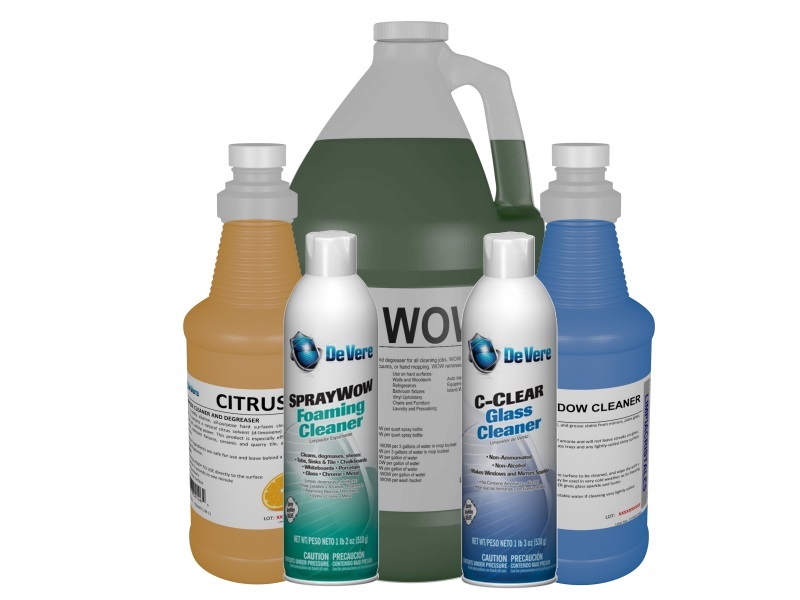 DeVere has many options when it comes to glass cleaners, so you may be wondering, which is the right glass cleaner for you? Every glass cleaner we offer has something that sets it apart from our other cleaners, you just need to know what you are cleaning and how you need to clean it. Our wide range of glass cleaners can solve any glass cleaning need you may have. Window Cleaner (Ready-to-Use) – This product removes dirt, minerals, oil, and grease stains from glass, windows, mirrors, fixtures, chrome and other washable hard surfaces. Window Cleaner is lightly ammoniated to optimize soil removal and drying. 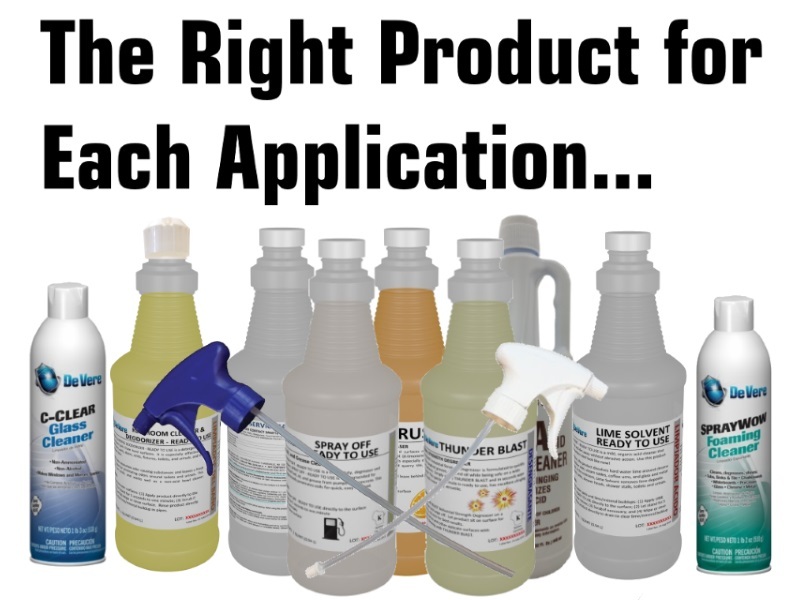 Simply spray and wipe to clean away most light soils. 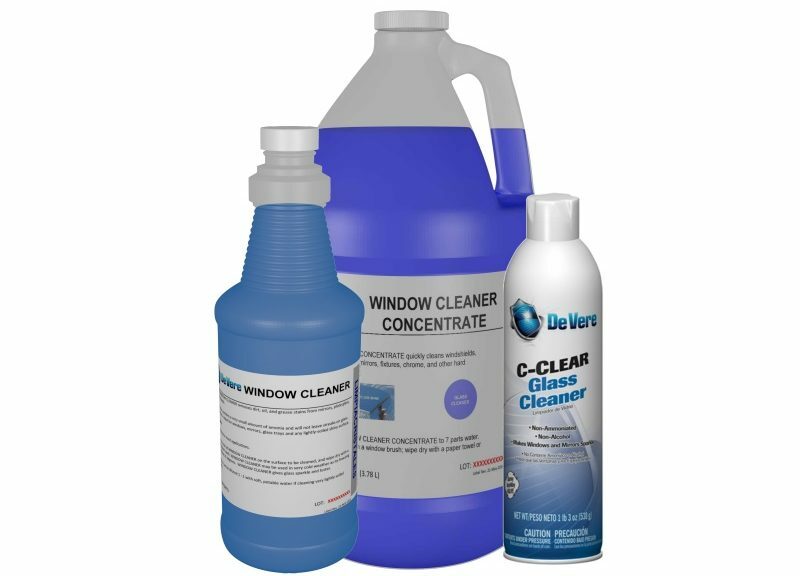 Window Cleaner Concentrate – Dilute 1 part to 9 parts water to make Window Cleaner (Ready-to-Use). Green Glass and Surface Cleaner – An all-purpose cleaner that quickly cleans windshields, windows, and other hard surfaces. 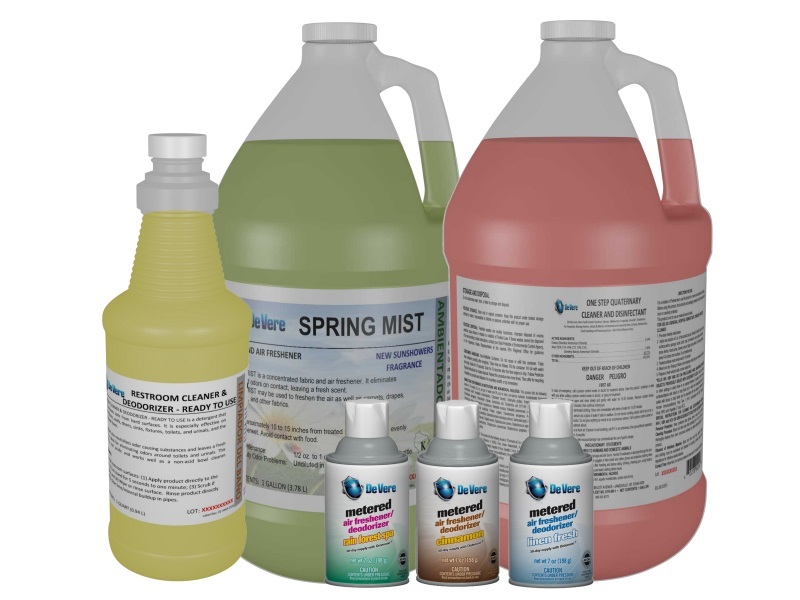 This product complies with the U.S. EPA’s Design for Environment (DFE), Green Seal, and other recognized environmental stewardship, safety, and sustainability standards. C-Clear – A convenient aerosol with a thick, white foam that clings to surfaces for ease of use. Use this product to quickly remove even challenging soils like wax from reflective and transparent surfaces. Vista Max™ – An all-weather aerosol windshield cleaner that cleans and polishes regardless of the temperature. Pure Clean – An all-purpose, hydrogen peroxide-based cleaning concentrate that works extremely well on glass when diluted 1 part to 255 parts water (0.5 oz/gal). This is the most cost-effective cleaning concentrate available including glass cleaners. Windshield Wash Concentrate – Ideal for gas station island wash buckets, especially in the winter as it has a very low freezing temperature. WOW, All Purpose Cleaner – A powerful, highly concentrated general purpose cleaner that works well in windshield wash buckets. WOW50 – A less aggressive version of WOW. This product is NPE-free and non-hazardous according to DOT regulations. For more information, visit the glass cleaners category page or contact us.